If the phone is configured to use web proxy but no web proxy credentials are provided, there is a risk that potentially disclose sensitive information. To exploit this vulnerability, an attacker must be able to access the VVX management interface and successfully log into an affected device. En preview depuis quelques semaines, Direct Routing est officiellement disponible globalement depuis hier. Très attendu dans les organisations, cela va permettre de démarrer les projets avec sérénité dans les organisations. [Microsoft Teams] Microsoft Teams pour Surface Hub disponible en preview! Annoncé en fin de semaine derniere, la preview de Microsoft Teams pour Surface Hub est disponible. Microsoft a rendu disponible une mise a jour intéressante pour le client Teams pour Android. Share a video while on a call or in a meeting. Use companion mode to share additional content from your phone in a meeting. 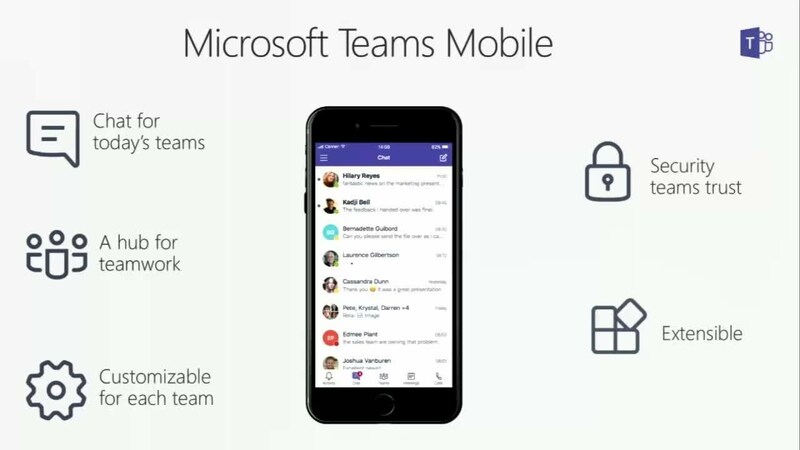 Microsoft a rendu disponible une mise a jour intéressante pour le client Teams pour iOS. Microsoft Teams est en constante évolution. Microsoft a rendu disponible le 20 juin 2018 une série de nouvelles fonctionnalités. App launcher comes to Teams on the web! A top request from you—make it easy to move between Office 365 apps and services. So, the Office 365 app launcher is rolling out to Teams on the web! Click the app launcher icon (affectionately known around here as "the waffle") in the upper left corner of Teams to switch to other apps. For people who love to let their fingers do the shortcutting, you'll want to review these updates. To see them, press Ctrl+. on Windows or Command+. on Mac. Only using Teams on the web? Get the app! We've made it easy to grab the app you need, right from Teams on the web. Never miss a notification and get a great app experience just right for the device you're on! Look in the lower left area for the Get app button. On Windows, if you click one of these link types, you'll be able to go to Teams to send that message or make that call. Ribbon a rendu disponible un nouveau firmware pour la technologie SBC SWe Lite. This release supports the Direct Routing Public Preview from Microsoft. There is a new configuration option for the user-entered Static Host to be used in the SIP Contact Header. This option is configured within the SIP Profile's "FQDN in Contact Header" field. Header Transparency is a new option in the SIP Signaling Group. This option indicates the SBC passes through all non-dialog related SIP headers from any inbound SIP messages to the outbound messages. An option is added to enable encrypting the contents of the AD cache for the SBC SWe Lite. This secures the contents against unauthorized viewing. Audiocodes a rendu disponible un nouveau firmware pour ces passerelles de types SBC et Media gateway. CLI command name change from "prefix" to "pattern"
Microsoft a publié pour ce mois de juin 2018 une mise a jour du client Skype for Business pour Mac. Skype for Business will display a notification when it detects conditions that can affect your audio and video quality such as long network delays, high CPU usage, or echo. Fixed an issue that prevented Outlook on Mac from setting the default value specified by policy for Customize access levels, presenter, options, and phone settings in Skype meeting options when scheduling an online meeting. Fixed an issue where the active call controls were not displayed in a call to a response group. Fixed an issue where the Rate My Call dialog box was displayed multiple times at the end of a call. Header Transparency is a new option in the SIP Signaling Group. This option indicates the SBC passes through all non-dialog related SIP headers from any inbound SIP messages to the outbound messages. For detailed information, see Creating and Modifying SIP Signaling Groups. - To rerun the step “Register Appliance”, you need to install .NET4.6.2 using Windows Update. Microsoft vient de publier une nouvelle mise à jour pour le client Skype for Business 2015 (Lync 2013). 32-bit: Download the 32-bit version of Skype for Business 2015 update package now. 32-bit: Download the 32-bit version of Skype for Business 2016 update package now. 64-bit: Download the 64-bit version of Skype for Business 2016 update package now. The Polycom VVX 101 business media and VVX 150 business IP phone do not support Hybrid Line Registration. You can configure phones registered with Skype for Business to display incoming caller names, outgoing recipient names, and the source the phone obtains names from. If the phone cannot match the number of the incoming or outgoing name to a name in your organization, the phone displays the name given in the SIP signaling. If a user saves a contact in the phone's local contact directory, the call lists display that name regardless of the priority you configure. BToE 3.8.0 is a must for use with UC Software 5.8.0. Polycom recommends you upgrade existing BToE and PDC desktop applications to the latest version starting with Polycom UC Software 5.8.0. If you update the BToE or PDC application without updating to UC Software 5.8.0 or vice versa, the applications will not work with your Polycom phone. Un intéressant post est accessible sur le site de Polycom présentant des modèles de téléphones. Ces modèles sont pour l'instant annoncés compatible seulement avec des environnements Skype Entreprise onpremise.